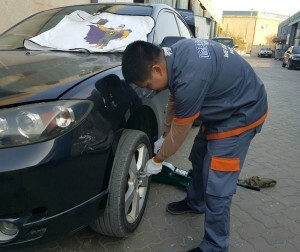 Guests and parents were pleasantly surprised when both Dial-A-Battery and Dial-A-Tire caught the attention of children at the Al Jalila Cultural center for children Spring camp parking lot by offering young campers the rare experience of learning to change both tires and batteries. “Different learning experiences like this don’t come very often” said Mr. Ahmed, Senior Technician at Dial-A-Battery. “Learning to change a tire and a battery at an early age is both valuable and enjoyable. These are practical skills that come in handy as adults so we are delighted to educate them early in life. It is our way of contributing to the community we live in. 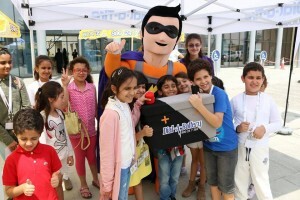 The presence of our mascot Mr. Volt also added to the excitement,” he added. Al Jalila Cultural center for children was established with the mandate to nurture children to be the leaders of tomorrow by offering them a rich cultural environment. It covers a wide range of cultural and creative programmes based on hands-on participation. It uses cultural experiences to help children understand their true identity and integrate better with the world around them. The Centre fosters creativity, curiosity, integration and aspiration, amongst other values. In particular it gives Emirati children the opportunity to understand and appreciate their authentic cultural heritage as they prepare to make their mark in the world. The 2-hour presentation was split into 20-minutes sessions where batches of 10-15 children gathered around the vans to learn about safe and efficient battery and tire changing methods. Dial-A-Battery also offered giveaways at the end of the demonstration. The event was promoted by a tactical social media campaign with the backing of radio media partner, Pearl FM. It happens to the best of us. You’re dashing off to work or an appointment… you turn the ignition key on and well, your car won’t start. Frustration immediately kicks in. You’ve guessed right – your vehicle has a flat battery! When your battery fails your vehicle won’t start, sometimes leaving you stranded in the middle of nowhere. So why take chances? Call Dial-A-Battery for a free battery testing service for cars, SUVs or light trucks. One of our professional technicians will give your battery a proper health check and advice on repairs or a replacement, so there is no downtime and you are back on the road without delay. “I also tell my customers to keep an eye on the Magic Eye. The “White Magic Eye” means your battery needs to be revived by re-charging. In cases where the battery has “Red Magic Eye” the motorist needs to replace the battery immediately,” Technician Sajid continued. Dial-A-Battery is the one source solution for batteries. All diagnostics are conducted on-site thus saving motorists all the trouble of having their vehicle towed or taken to workshops. The company stocks large range of SOLITE, Bosch & AC DELCO batteries and is equipped with state-of-the-art computerized systems that save the motorist valuable time and money.